This innovatively-named brand may seem familiar to you, although you may never have given it a try. It started around 2008 as an alternative to the popular Google and Yahoo search engines. Its main concept? Privacy! 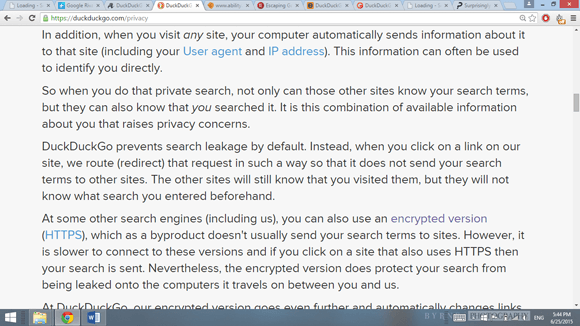 Since then, Duckduckgo is gradually trying to enhance the level of your privacy without sacrificing the range of the appearing results. This has led to a rapid increase in terms of its daily usage (600% rise on its search queries over the last couple of years), especially in the post-Snowden era that revealed the magnitude of online surveillance and tracking, reinforcing the desire to protect our personal data from exposure to anyone. How other search engines handle our personal data? Most search engines like Google or Yahoo keep track of our search history in order to improve the results and adjust the displayed ads to our preferences, a process widely known as search leakage! Even if you choose the incognito option of your browser, both your query and visited website information are stored. Also with this information your searches can be tied together so that someone can see everything you’ve been searching for not just one isolated search! And why should we worry about this? Simply because all this stuff can be released to the public on purpose or accidentally and also be given to law enforcement! Is there any other reason to prefer Duckduckgo? Like Google, it can handle searches for news, images, audio, weather, recipes and video, and there’s an integrated Instant Answer option. You can also customize the layout of Duckduckgo through a variety of given themes and adjust the search language or the region of interest. 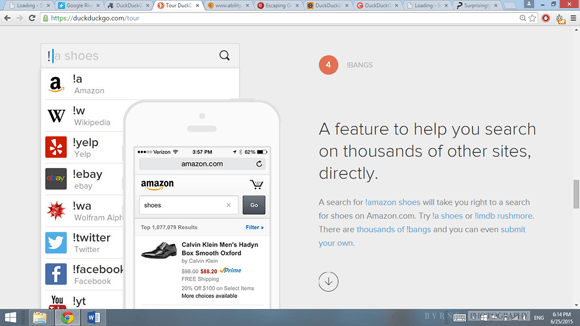 Moreover, there is another interesting feature integrated that enables you to access hundreds of online stores (Amazon etc.) or even YouTube and Facebook, by just adding an exclamation mark (!) in front of your search keyword. People are finally becoming aware of all the downsides of online tracking, including surveillance, ads following you around the Internet, and being charged different prices based on your profile. If you can get both a great experience and privacy at the same time, then it’s really a no-brainer to switch to a private alternative and prevent yourself from being tracked.